Bambito Hotel where the specialty is trout. One of the specialties at the Bambito Hotel is trout fresh from its own fish farm across the road. 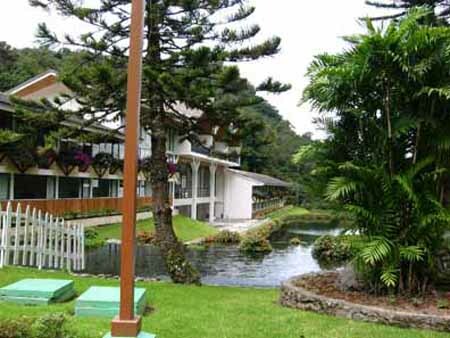 The Bambito Hotel in the Highlands of Chiriqui, between Volcan and Cerro Punta, nestles among manicured lawns, dazzling flowers and large trout-filled ponds at the base of a small, wide ravine. It's one of those places that look as if it should be more expensive than it is. Rooms are comfortable, there are a couple of attractive honeymoon cottages, tennis courts, a large swimming pool, and horses for those who want to ride. And, like the countryside around it, it is peaceful. In fact, in the off-season months the Bambito Hotel is mostly deserted. I understand they keep a master chef there only for the high tourists season between December and April. Perhaps that is why I found the food no more than acceptable and the service painfully slow despite the high prices. Four of us shared finger snacks and a couple of drinks early one afternoon. Cost: in excess of $40. The food took more than 45 minutes to arrive, and we were the only people in the large restaurant. Perhaps it is better in busier times. Recommendation: if you eat in the Bambito Hotel, find out what can be served quickly if you are in a hurry. However, the scenery is such that it's almost worth it to be able to take the extra time to look out of the window and watch wild ducks land on the multi-level ponds. 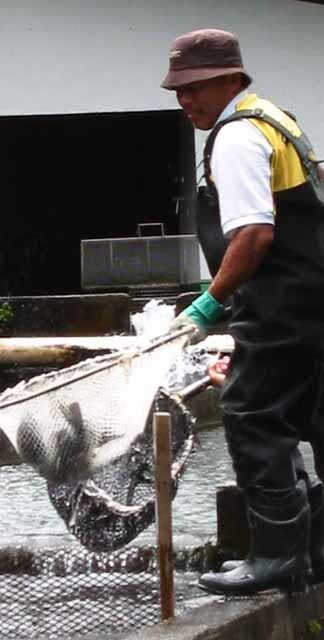 Across the road and owned by the Bambito Hotel is a fish farm that raises 100,000 trout a year for the hotel and to supply the market in Panama City. Prices may vary during the year, but when I was there in May 2005 a one-pound filleted trout fresh from the water cold from Volcan Baru was $1.50. You can even borrow a rod and have the fun of catching supper yourself.